"The Team That Plays Together, Stays Together"
If you want to energize your people and inspire them to collaborate and bond in new ways, our Corporate Team Building Events may be perfect for your next onsite or offsite corporate outing. Our teambuilding events offer options for corporations, sports teams, campers and youth groups. Choose the game that appeals to everybody in your group, with our many scenarios the games are always fresh and exciting. Laser tag, a popular sport with adults and children, incorporates all the elements of critical thinking and decision making that bolsters teamwork. Laser tag is completely safe and so much fun that players may forget that they're learning valuable skills while growing a stronger bound. Imagine the excitement that will be generated when your employee teams compete for the chance to take on management in an intense, invigorating laser tag battle. Come see why companies such as Martin's Point Health Care, County Physical Therapy, LLC, Verizon, Davita Dialysis, Huber Engineered Woods, Lifespan Family Healthcare, Price waterhousec oopers, TD Bank, N.A. 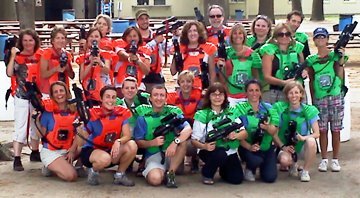 Mortgage Operations, Progressive Insurance Companies, Farm Credit of Maine, Macdill Air Force Base, IDEXX Laboratories, Sisco Systems, Radiology department at Cary Medical Center, Maine Criminal Justice Academy, The Via Agency with Klondike, and Many Others have all chosen laser tag to boost morale and increase team spirit, it's just that simple! Call us today at (207) 227-5562 speak with a G-Force Laser Tag representative and schedule the BEST Birthday Party or Special Event on this planet!! Also Available Corporate Outings, Fund Raising, Adventure Camp, Team Building Events, Grad Nights, Youth Center Activities, Family Get-Togethers, Fairs, and Special Events or Just Plain Laser Tag Fun!!!. Remember We Travel Anywhere On Our Planet For Laser Tag Events.